Nelson Mandela said, “Education is the most powerful weapon we can use to change the world.” We couldn’t agree more. Quality education helps break the cycle of poverty. It promotes equality and empowerment, enables economic growth and prosperity, and helps create a more peaceful, sustainable society. The UN Sustainable Development Goals list inclusive, quality education and lifelong learning as one of the key drivers in helping achieve many of the 17 Global Goals. Powerful indeed. Mandela’s words are particularly meaningful as we close out 2018, marking 100 years since the birth of the former president of South Africa and Nobel Peace Prize winner who, personally, aspired to end extreme poverty and understood the importance of education in that quest. In 2005, speaking at the “Make Poverty History” rally in London, Mandela said, “Overcoming poverty is not a gesture of charity. It is an act of justice. It is the protection of a fundamental human right, the right to dignity and a decent life.” Mandela, who was 86 and in failing health at the time, challenged the crowd to pick up the mantle to end poverty for all: “Sometimes it falls upon a generation to be great. You can be that great generation. Let your greatness blossom.” Mandela died in 2013 before his vision could be realized. But others embraced the challenge, like our partners at Global Citizen, who are building a movement to end extreme poverty by 2030. This includes addressing the systemic causes of extreme poverty, like access to quality education, equality and equity for girls and women, access to essential health services, addressing hunger and nutrition, and improving access to water, sanitation and hygiene. Today, Global Citizen launched an urgent global call to action, Demand Freedom. Defeat Poverty, aimed at leaders and corporates who have not yet committed to taking action to solve the root causes of poverty, including advancing access to quality education for all.Tied to the Dec. 2 Global Citizen Festival: Mandela 100 in Johannesburg, South Africa, the Demand Freedom. Defeat Poverty puts a fine point on a focused six-month campaign to #BeTheGeneration to compel world and corporate leaders to make significant changes and commitments to deliver on Mandela’s dream of ending poverty. At Mandela 100, HP and other leaders will join artists like Beyoncé, JAY-Z, Cassper Nyovest, D’Banj, Ed Sheeran, Eddie Vedder and others to make commitments on the issues surrounding extreme poverty. Demand Freedom. Defeat Poverty urges others join the fight. Mandela’s home country of South Africa is a fitting backdrop, located on a continent that is expected to have the largest working-age population by 2035. Populations across Africa are growing, and the continent is urbanizing faster than any other part of our planet. This creates tremendous economic growth potential, yet a large share of the population remains undereducated and underemployed. HP firmly believes education is a fundamental human right and has long invested in increasing access to a quality education and lifelong learning opportunities in Africa. This includes offering free business and IT skills training through HP Learning Initiative for Entrepreneurs (HP LIFE). Started as a face-to-face program in 2007, HP LIFE training was offered in hundreds of training centers in countries such as Nigeria, Tunisia, South Africa, Uganda and Kenya, helping empower people to start or grow a business or improve their employment prospects. HP LIFE expanded to an online platform in 2012 and is now a program of the HP Foundation. Nearly 106,000 people across Africa have received HP LIFE training since 2007. In Tunisia, for example, HP LIFE is included in UNIDO’s youth employment project branded “Mashrou3i” (which means “My project” in Arabic). Since 2013, Mashrou3i has enabled young people to create 3,400 jobs, including 450 start-ups, and aims to create 6,000 more jobs by 2021. The program expanded to Nigeria in 2017. HP is also working with Microsoft to empower people living in the Dzaleka Refugee Camp in Malawi, Africa. AppFactory is a program to improve the state of software development and to bring quality learning, IT skills development and entrepreneurship training to these refugees. To honor Mandela’s legacy and inspire action in the lead up to the December 2 Global Citizen Mandela 100 Festival, HP South Africa has engaged the local community in an immersive sustainable impact experience. Setting up in local shopping centers, HP has been welcoming people of all ages to use virtual reality technology to see themselves as part of the movement for change. Visitors are also invited to take a pledge to be a global citizen, and they can print their own impact portrait to remember the experience and their ability to effect change. 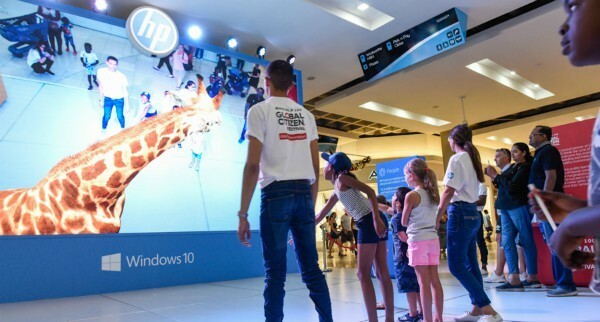 In select retail location across Johannesburg, HP and Microsoft are also temporarily “rebranding” stores to build awareness of the Global Citizen #BeTheGeneration campaign. These in-store displays inspire shoppers to take immediate steps, including supporting the Nelson Mandela Charity or taking action on the Global Citizen platform to earn points that can be redeemed for a chance to win tickets to the Mandela 100 Festival. HP has also partnered with News24, a major local news network in South Africa, to highlight and promote the stories of young African changemakers who are working to #BeTheGeneration to tackle major global challenges. HP has partnered with Global Citizen since 2013 to power the movement to advance quality education and end extreme poverty by 2030. Together we share a common vision of a more equal, healthier and prosperous future. At the Global Citizen Festival India, for example, HP committed to develop 48 self-contained, IT-enabled digital inclusion and learning labs, called HP World on Wheels. The mobile labs reach underserved populations throughout rural India, with an aim to serve about 6,400 Indian villages and impact more than 15 million people by 2022. The first 12 World on Wheels learning labs rolled out in 2017, and a dozen more are being added this year. Also, at the Global Citizen Festival Hamburg, HP announced a bold commitment to enable better learning outcomes for 100 million people by 2025—and we’re well on our way. Through 2017, 14.5 million have benefited from HP’s education programs since the beginning of 2015. Through partnerships, like the one we share with Global Citizen, we are leaning in to finish what others may consider “impossible.” We hope will join us in honoring Mandela’s life and legacy by committing to #BeTheGeneration to end extreme poverty and achieve the Global Goals by 2030. Join me and Global Citizen in taking action today to Demand Freedom. Defeat Poverty. Follow @HPSustainable on Twitter to learn more about our new learning commitment that’s being announced onstage at the Global Citizen Mandela 100 Festival on Dec. 2, and tell me in the comments below what you’re doing to pick up the mantle to ensure everyone has access to quality education. Mandela is credited with saying, “It always seems impossible until it’s done.” Together, I know we can get this done.